Creativity is a trait that we all have; we express in many different ways. 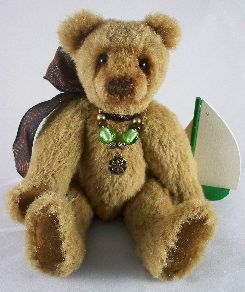 You have only to look at the variety of bears, created for this challenge, to see that it is the artist that brings something special and unique to the table. These crafts people are ARTISTS because they use the resources around them to make something fantastic. 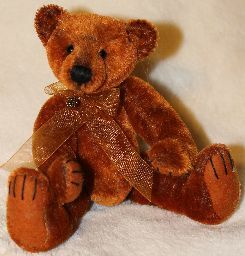 Lil Buddy is made of German mohair and synthetic plush with glass blown eyes, poly fill and copper pellets for weight. 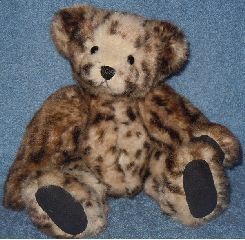 Paw pads are upholstery fabric and he wears a brown ribbon collar is around his neck. He stands 8" tall. 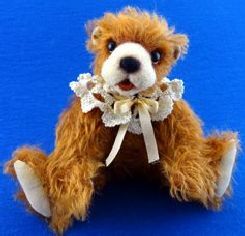 Months before the Tampa Teddy Bear Show opened, artist were given a simple teddy bear pattern and instructed to "make it their own" through the use of fabrics, colors and needle felting enhancement to the face and paw pads. They created adorable facial expressions including putting a sparkle in the bear's eyes. For it is the artist that brings a bear to life! 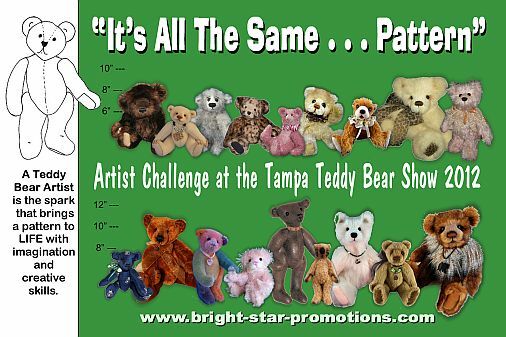 During the Annual Tampa Teddy Bear Show, sponsored by Bright Star Promotions, artists were given an opportunity to prove this theory. paw pads, and the inner ears. Attending collectors voted for the bear they liked best. They were amazed by all the different bears that all came from the same pattern! 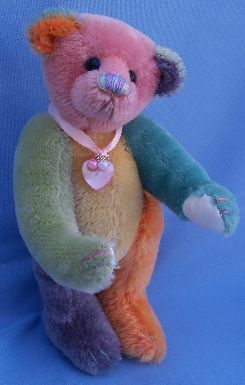 Bears stood 5 1/2" inches tall and others were twice that size and ranged in colors from white bears to every color in the rainbow. It was amazing to see what each artist completed, putting their own special twist to the pattern. Everyone seemed to have a favorite; they were all so cute! While stores ensure sameness, artist bears assure individual uniqueness. It's not just the one-of-a-kind nature of artist bears, it's the piece of the artist's creativity, their special point of view and perspective. 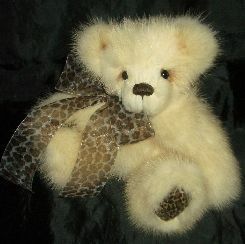 It's the glance into their imagination whether made with real fur, material, plus or mohair. 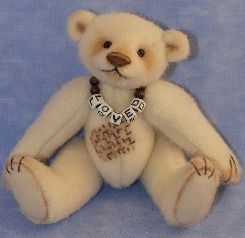 It's knowing that the artist designed bear you choose is as much of an individual as you are . . . . . that is priceless! "How can I choose?" was often heard and "It's amazing that each is made from the same pattern." 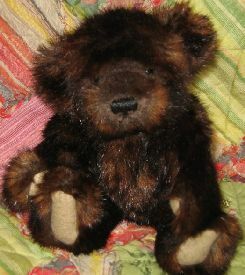 One collector even questioned Valerie Rogers, the show's promoter, "Are you sure the bears are all from the same pattern?" Valerie reassured her that they were! 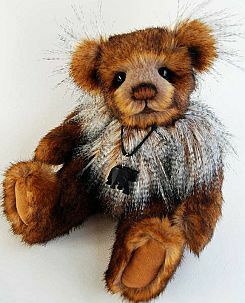 Zulu is a 11" teddy bear made from German synthetics and has German glass eyes, Ultra-suede pads and is stuffed with pellets/poly-fil. Hand shading around muzzle and eyes. 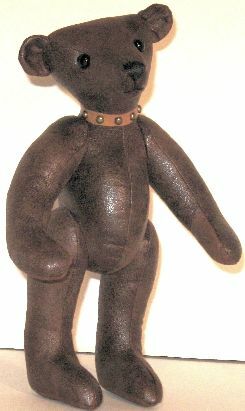 He wears a cord necklace with an ebony wooden elephant around his neck. Koi is made with white mohair. His paw pads are cream colored suede. He is fully jointed and is stuffed with poly-fil and glass beads. 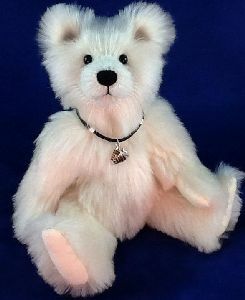 Koi has a needle felted nose, German glass eyes and stands 10 inches tall. Left to Right the top winners are: George Weber, Art Rogers, Dian Pete, Pat Berkowitch, Valerie Rogers, Meg Jackson and JoAnne O'Hanlon. The votes were tallied at 2 p.m. and awards presented by 2:30 p.m. Included in their awards was a duplicate of the poster, cash prizes, ribbons and an engraved award for JoAnne! Everyone will be waiting to see what next year's challenge will be! 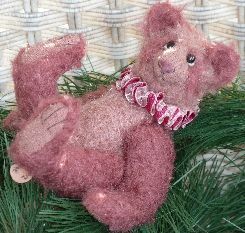 Ashenberry's Judy Eppolito used pink mohair to create Rollo a relaxed 6 1/2" with a matching ruff. PRFect Pals. 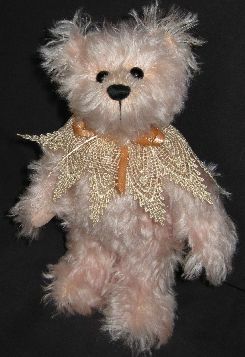 Pat Fairbanks used a soft pink, imported German Feather Mohair and vintage lace for the collar on Precious a 8.5" tall bear. 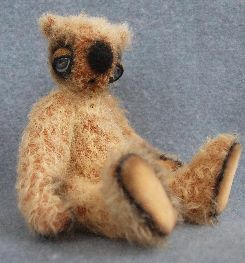 mohair with Needle-felted face to create Challenger just 8" tall. 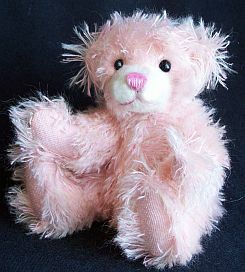 Martha Burch's Cotton Candy is 6" tall and made from a soft pink mohair with cotton paw	pads. 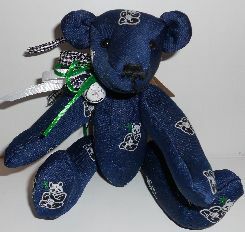 Princess4Paws'	Marge Wiese took on the challenge as she usually crochets her little bears. 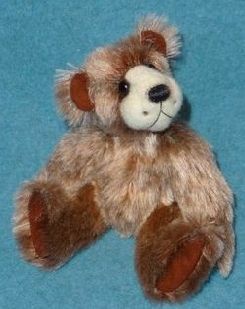 Andrea is 7 1/2" tall and made from sparse curly German Mohair. to be on our mailing list! You don't want to miss the fun and excitement! Article by: Rachel Emerson, Dawn Emerson and Diana Stanton staff writer. Photos courtesy of Bright Star Promotions, Jerry Franks and Meg Jackson.